The reputation of the annual Barkley Marathons, which runs through the wilds of Frozen Head State Park, is likely enough to give the casual hiker pause before setting out into this underappreciated (yet gorgeous!) stretch of East Tennessee woodland. Over the years the Barkley has become known as "the race that eats its young," and for good reason. In its 27-year history, barely a dozen people have managed to complete the full 100-mile “course” within a 60-hour time frame. We use the term “course” loosely, though. Racers set out with just a compass and a map to find their way through the wilderness, mostly without the guidance of trails, to collect pages from books scattered about the woods. They can head for the finish line only after completing the required tasks. But don’t let the hype scare you away. Even if you aren’t an ultra-marathoner likeDeWayne Satterfield, sticking to the park’s trails offers a way to experience the park’s allure with considerably less risk and exhaustion, though there are still some strenuous hikes throughout the backcountry of this 24,000-acre park. Elevations range from about 1,300 feet to more than 3,000 feet, topping out on the summit of Frozen Head Mountain at 3,324 feet, one of the highest peaks in Tennessee west of the Great Smoky Mountains. Frozen Head State Park abounds with trails, making it a great destination for weekend backpacking or a one-day loop, especially considering it just an hour’s drive from Knoxville (depending on the weather). Whichever stretch of adventure you’re looking for, this is a good place to get a taste of the Barkley. 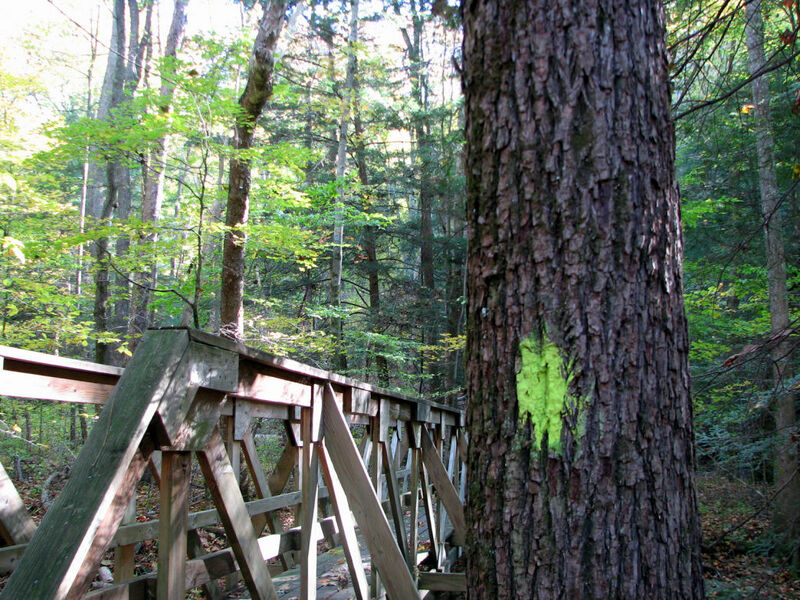 Whether you’re going out for a weekend backpacking trip (covered in the next section) or just a day in the woods, the best place to start is at the park’s visitor’s center, which sits near the trailhead for Chimney Mountain (marked with a green blaze). First things first, grab a map if you haven’t already printed one off the park’s website, and brace yourself. You’ll definitely work up a sweat on this nearly 9-mile hike following Chimney Top Trail to Spicewood Branch, which will eventually drop you back near the visitor’s center. Also note that the park locks its gates at dusk each evening, trapping in campers and backcountry hikers if you don’t get back in time. The ascent to the summit of Chimney Top is sure to make you appreciate this rugged landscape and the challenges faced by Barkley marathoners—though they don’t have the luxury of a well-worn trail. The path gains more than 1,500 feet in just a few miles, topping out at a peak of 3,120 feet after a number of switchbacks. It’s a tough climb, and no doubt one that more experienced hikers may underestimate, so come prepared. Bring enough water to last most of the climb. Refill before the summit at Rocky Fork Branch, with your next chance likely being at Beech Fork about halfway through the 9-mile hike. Once atop the ridgeline, you’ll be rewarded with views of East Tennessee’s three major geologic features: The Tennessee Valley Below, the Great Smoky Mountains, and the Cumberland Plateau. The full length of the Chimney Top Trail is about 7 miles, though taking the Spicewood Branch Trail shortens the route by about a mile. Marked with a purple blaze, the Spicewood Branch Trail is the first marked trail you’ll encounter. The path heads down along a waterway of the same name before merging with other trails and exiting at the Old Mac trailhead near the visitor’s center. For a longer trek with more striking views and attractions, continue on along the Chimney Top Trail, past the connection Spicewood Branch. 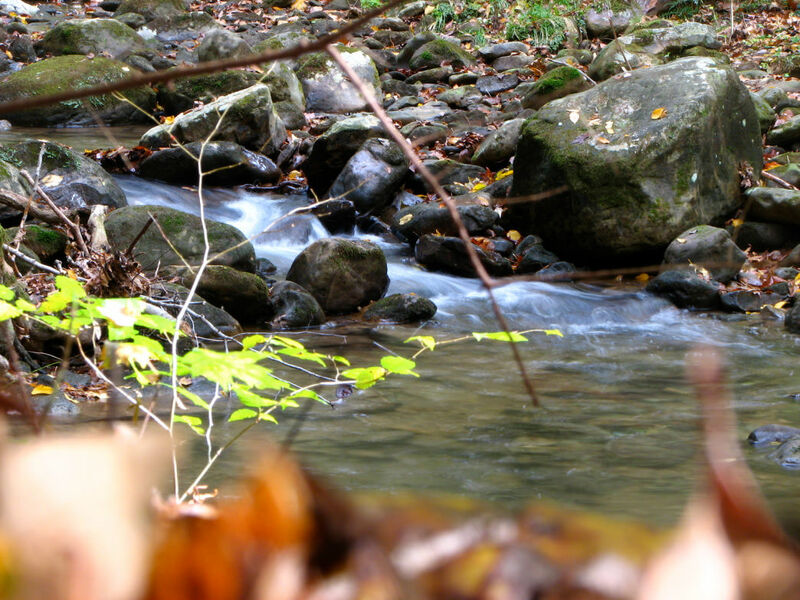 About a mile further and you’ll come to the Tub Spring Campsite, where several trails merge. From here, it’s a short jaunt (about half a mile) up to the lookout tower atop Frozen Head Mountain. It’s the highest point in the park at 3,324 feet, so take some time to soak up the lush scenery of distant mountains and valley below. Back on the trail, opt to continue on along the ridgeline on Lookout Tower East Trail, heading north. A unique place to hole up for the night is the Panther Gap Rockhouse, just a quarter mile or so from the junction at Tub Spring Campsite. The primitive camping area is sheltered by a huge rock outcropping, though it tends to collect water and mud. Coyotes have been reported in the area, though not many bears. Water can be collected falling off the rocks, or perhaps from Sugarcamp Branch running nearby (make sure you treat the water before drinking of course). Approximately eight miles from the start of Chimney Top trail, Panther Gap Rockhouse is hardly a full-day’s hike, though it may prove a good stopping point after making the climb up Chimney Top. Set up camp here before venturing up to the lookout tower and save yourself from having to lug heavy gear up and back down. Otherwise, continue on to Square Knob Campsite, the next backcountry pad available, a little less than 1.5 miles further up Lookout Tower East trail. Soon after Square Knob, the Cumberland Trail junction comes into view. 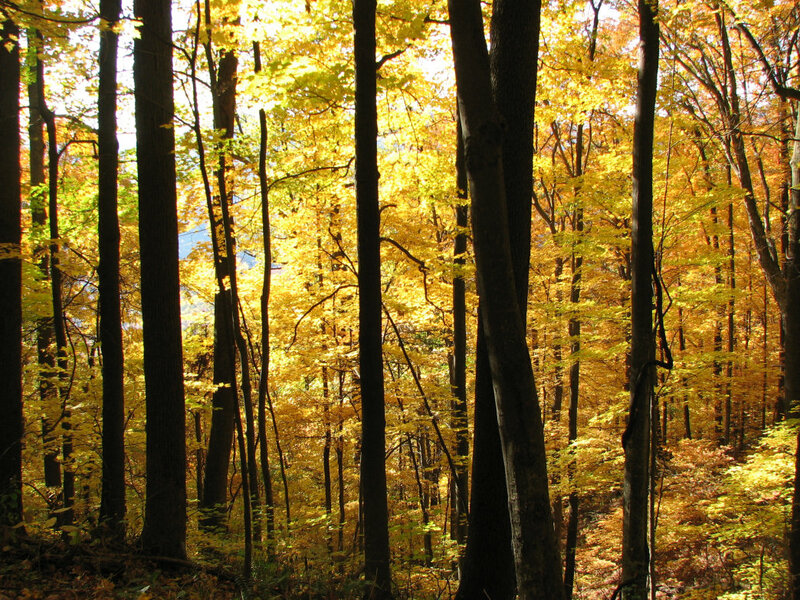 Stick to the Lookout Tower Trail, which here changes names to Lookout Tower West. The trail skirts the south face of Bird Mountain, exiting 6.3 miles at the park’s main campground. 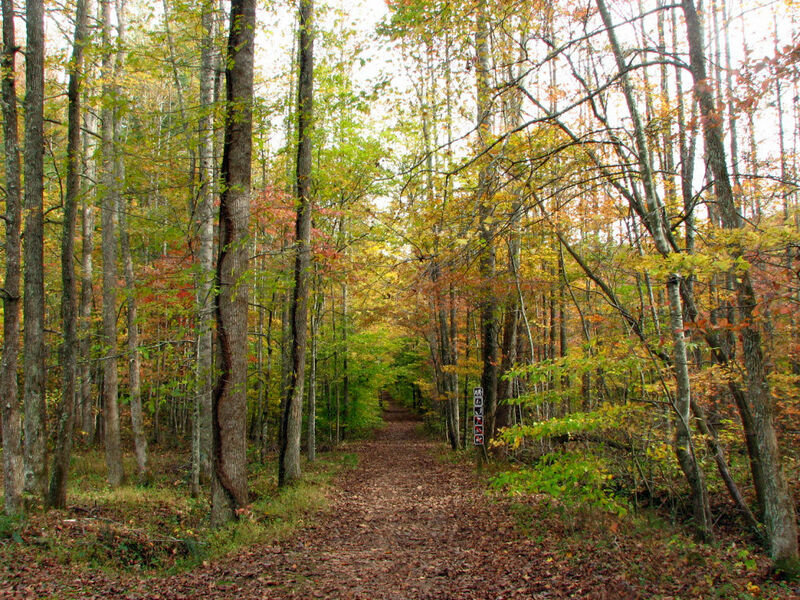 If you’re looking for a more strenuous hike along the Bird Mountain ridgeline, take the Cumberland Trail west to Bird Mountain Trail, which connects back to Lookout Trail near the Big Cove trailhead and campgrounds. Follow the main road back to towards the visitor’s center, or take another detour to follow the Flat Fork Creek trail along the park’s main drag, exiting at the visitor’s center. 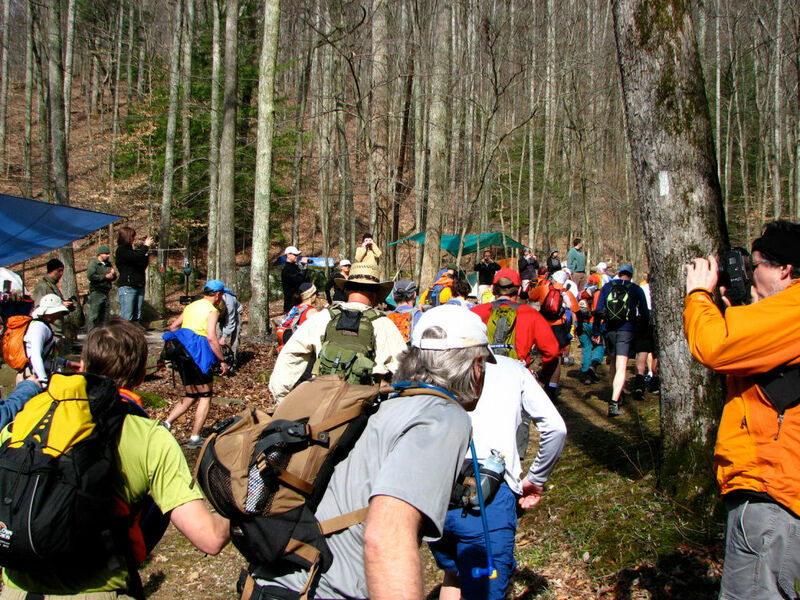 Regardless of which route you take, you’ll be faced with sharp ascents and sense of solitude far removed from the bustling crowds that gather at the Great Smoky Mountains National Park, and just perhaps you’ll earn a deep appreciation for the Barkley Marathons and its contenders.